A recent Bloomberg article documented the hard-partying lifestyle of two young entrepreneurs who struck it rich when they sold their alternative funding business. The story of their beer-soaked early retirement in a Puerto Rico tax haven came complete with photos of the duo astride horses on the beach and perched atop a circular bed. But two other members of the alternative-finance community have chosen a different path despite somewhat similar circumstances. 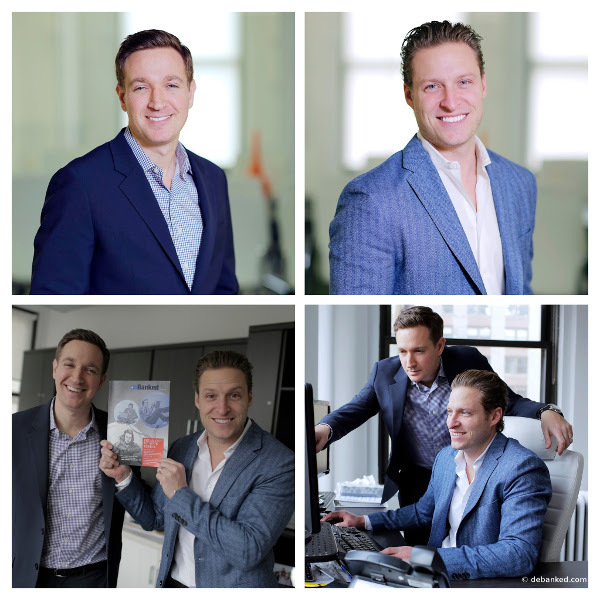 Jared Feldman and Dan B. Smith, the founders of New York-based Fora Financial, are about the same age as the pair in that Bloomberg article and they, too, recently sold an equity stake in their company. Yet Smith and Feldman have no intention of cutting back on the hours they dedicate to their business or the time they devote to their families. They retained a share of Fora Financial that they characterized as “significant” and will remain at the head of the company after selling part of it to Palladium Equity Partners LLC in October for an undisclosed sum. Palladium bought into a company that has placed more than $400 million in funding through 14,000 deals with 8,500 small businesses. It expects revenue and staff size to grow by 25 percent to 35 percent this year. The deal marks Palladium’s first foray into alternative finance, although it has invested in the specialty-finance industry since 2007, said Justin R. Green, a principal at the firm. His company is appointing two members to the Fora Financial board. Negotiations got underway after Raymond James & Associates, a St. Petersburg, Fla.-based investment banking advisor, approached Palladium on behalf of Fora Financial, Green said. RJ&A made the overture based on other Palladium investments, he said. The Palladium deal marked a milestone in the development of Fora Financial, a company with roots that date back to when Smith and Feldman met while studying business management at Indiana University. 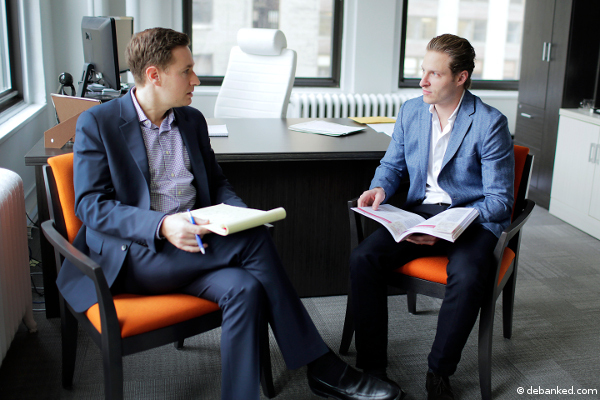 After graduation, Feldman landed a job in alternative funding in New York at Merchant Cash & Capital (today named Bizfi), and he recruited Smith to join him there. “That was basically our first job out of college,” Feldman said. They had enough confidence in the future of alternative funding that they didn’t worry unduly about the rocky state of the economy at the time. Still, the timing proved scary. Lehman Brothers crashed just as Smith and Feldman were opening the doors to their business, and all around them they saw competitors losing their credit facilities, Smith said. It taught them frugality and the importance of being well-capitalized instead of boot-strapped. Their first office, a 150-square-foot space in Midtown Manhattan, could have used a few more windows, but there was no shortage of heavy metal doors crisscrossed with ominous-looking interlocking steel bars. The space seemed cramped and sparse at the same time, with hand-me-down furniture, outdated landline phones and a dearth of computers. Job seekers wondered if they were applying to a real company. At first, Smith and Feldman paid the rent and kept the lights on with their own money. Nearly every penny they earned went right back into the business, Feldman said. The company functioned as a brokerage, placing deals with other funders. From the beginning, they concentrated on building relationships in the industry, Smith said. “Those were the hands that fed us,” he noted. By early 2009, Smith and Feldman started raising capital from friends and family members so that they could fund deals themselves. About that time, they developed a computer platform to track the payments they received from funding companies where they placed deals. Smith and Feldman’s first credit facility came from Entrepreneur Growth Capital. The stake enabled them to begin handling deals on their own instead of passing them along to funders. At the same time, they expanded their computing platform to handle entire deals. From there, Smith and Feldman expanded their computing capability to help with accounting, underwriting and other functions. A combination of staff and outside developers guided the platform’s evolution. Today, three full-time in-house tech people handle programming. Smith and Feldman emphasize that they don’t consider Fora Financial a tech company, but Green said the company’s platform helped cinch the deal. “We view Fora Financial as a technology-enabled financial services company,” he maintained. Meanwhile, Fora Financial moved six times to larger accommodations. 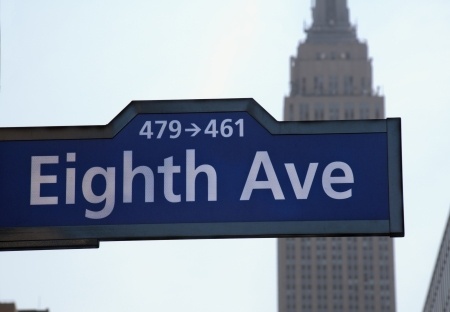 The company’s 116 employees now occupy 26,000 square feet in Midtown, with half of the staff working in direct sales and the other half devoted to back office, underwriting, finance, IT, customer service, collections and legal duties. Seventy percent of the company’s business flows from its inside sales staff and the rest comes from ISOs, brokers and strategic partners, Feldman said. “Most of the industry is the opposite,” he noted. 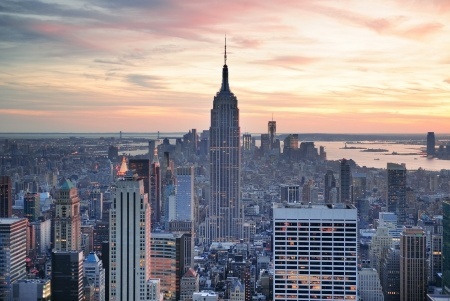 Finding salespeople presents a challenge in New York, where they’re in great demand. “We’ve invested a lot of money in finding the right salespeople,” Feldman said. “We also have to make sure that we’re right for them.” The sales staff includes recent graduates and experienced people from other sectors of financial-services or other businesses, Feldman noted. “We don’t hire from within the industry,” Smith added. “From Day One, we’ve been training our staff our way and not bringing in tainted brokers.” That way, the company can make sure salespeople hew to the company’s ethical approach to business, he maintained. It’s part of creating a company culture, he said. The Fora Financial culture also includes strict compliance with state and federal regulation because until recently Smith and Feldman owned the entire company, Feldman said. “Regulatory compliance is a core value with us and has been for some time,” he noted, adding that it’s also resulted in conservatism and due diligence. Nurturing a penchant for compliance and dedicating a company legal and compliance department to pursuing it became a factor in Palladium’s decision to become involved with the company, Feldman said. The focus on compliance also spread to the way Fora Financial brings brokers on board, Smith said. The company scrutinizes potential partners carefully before taking them on, he maintained. “We probably missed out on some business as the industry grew because we were more cognizant of doing things the right way, but that paid off in the long run and some of our competitors have followed suit,” Smith said. 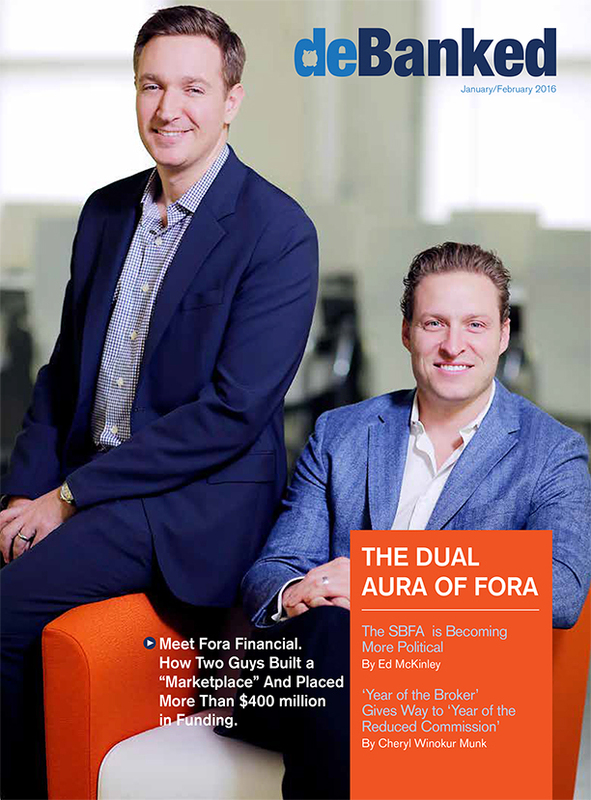 Compliance first became particularly important when Fora Financial added small-business loans to their initial business of providing merchant cash advances. They began making loans because lots of businesses don’t accept cards, which serve as the basis for cash advances. On a cash basis, the current portfolio is 75 percent to 80 percent small-business loans. Loans started to surpass advances during the fourth quarter of 2014. The shift gained momentum after the company began funding through its bank sponsor, Bank of Lake Mills, in the third quarter of 2014. Growth of loans will continue to outstrip growth of cash advances because manufacturers, construction companies and other businesses usually don’t accept cards, Smith said. If a customer qualifies for both, Fora Financial helps decide which makes the most sense in a specific case, Feldman added. “We don’t sell our loans – we carry everything on the balance sheet and assume the risk,” Feldman said. “If it’s not good for the customer, it’s going to come back and hurt the performance of our portfolio over time,” he noted. That thinking helped the company recognize the importance of adding loans to the mix. “We were one of the first companies (in the alternative-finance industry) to get our California lending license,” Feldman said. The company obtained the license in 2011 and got to work on lending. Offering loans required some retooling because the underwriting criteria differ so much from those in the cash advance business, Feldman said. With the help of several law firms, they made sense of regulation from state to state and began offering the loans one state at a time, Smith said. “We wanted to make sure we rolled it out the right way,” Feldman noted. As the company was changing, Smith and Feldman saw a need to rebrand. Initially, they called their company Paramount Merchant Funding to reflect their merchant cash advance offerings. When they added small-business loans to the mix, they used several additional names. Now, they’ve brought both functions and all of the names together under the Fora Financial brand. Fora means marketplace in Latin and seems broad enough to cover products the company might add in the future, Feldman said. Despite changes in the business, Smith and Feldman have managed to remain true to timeless values in their personal lives. Smith grew up near Philadelphia in Fort Washington, Pa., and Feldman is a native of Roslyn, N.Y. Both now reside in Livingston, N.J. and occasionally ride the train together to work in New York. Smith is married and has two children, while Feldman and his wife recently had their first child.